Se solnedgangen og månen stiger utenfor kysten av Key West på dette 2-timers solnedgangskrysset. Nyt naturen og fredelig ro på en sen ettermiddags seil ombord på en 60-fots katamaran med rikelig med dekkplass for å strekke seg ut og nyte den fantastiske utsikten. Deretter ser du en legendarisk Key West solnedgang mens solen glir og setter seg forsiktig inn i vannet. Hjertelig appetittvekkere pluss champagne, vin, full spritbar, iskald øl og brus er inkludert. Med premium øl og vin og appetittvekkere i stor grad, er dette Key West solnedgang cruise et snitt over resten. Det er få ting mer avslappende og hyggelig enn en rolig solnedgang seil. Key Wests solnedganger er kjent for å gi noen av de beste utsikten i verden. Det er derfor massene som samles i Mallory Square for å se dem, er enorme. Unnslippe galskapen og opplev den fantastiske utsikten fra vannet på dette 2-timers Key West solnedgangskrysset. Klatre ombord på Flyer , en elegant 60 meter lang (18 meter) katamaranbåt med over 140 meter (140 meter) dekkplass for å strekke seg ut og nyte naturen. Føler den varme, tropiske sjøluften og se aktiviteten langs kystenes landemerker: Key West-havnen, Mallory Square's travle, pluss Navy Mole, Fort Zachary Taylor Historic State Park og mer. Så er det solnedgangshimmelen, som et maleri med sine strålende striper av farge når skumring kommer og strålende sol begynner å falme og bosette seg i vannet. Båten vil være perfekt posisjonert, så ta med et kamera for å fange denne fantastiske utsikten. Nyt hjertelige snacks og gratis champagne, vin, sangria, fullvannsbarn, iskald øl og brus. Det er også en full sprit bar inkludert! Our sunset Champagne cruise was on April 8, 2019. The crew and the appetizers were great; the sunset spectacular. Definitely recommended!! My boyfriend and I LOVED our time on the boat. Although the sunset wasn't the best that night, the crew was amazing. Very friendly and genuinely wanted to get to know us. The cocktails were fantastic and the food was very delicious. Great way to end our weeklong vacation in the Keys! Took the 6pm sunset cruise with Captain Morgan (yes, that's really her name). She and her crew were wonderful "hosts" - very engaging to talk with and great tour guides. The cruise included an open bar (I recommend the rum punch!) and decent appetizers (hey, it's a sailboat not a cruise ship, what do you expect). While the boat can hold 60 people they cap it at 36 so there is plenty of room to move about and you don't feel like you're on board with a gazillion other people. I highly recommend this cruise! We had a wonderful time on the Key West Sunset Champagne and Appetizers Cruise...not only did we see an absolutely gorgeous sunset, we had a very relaxing time. The weather was wonderful and we met some nice couples on the boat. The staff was attentive and brought around passed appetizers that were fairly substantial. There were plenty of drinks on board as well. This was a lot of fun and it was windy enough that the catamaran was able to use the sails. Highly recommend this fun outing! Booked this trip just prior to flying to Key West. Noticed that the number of passengers was a bit less than a competitor but that was to our benefit. A fantastic experience from beginning to end. Great service, food, drink, music, and of course a fabulous sunset. Great captain and first mate. Small, 20 person craft made for a personalized trip. Smooth sailing was appreciated . Lots of very good appetizers to eat. 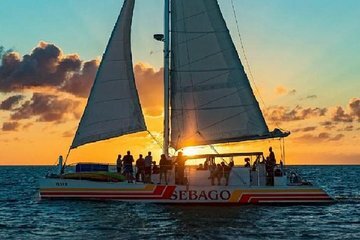 Will go with Sebago for the next sunset trip. Well worth the price, this Cruise was fantastic. The crew, Tim, Mike, and Rory, I believe, was courteous, knowledgeable, and engaging, and provided excellent customer service. We would definitely do it again! My wife and I took this two hour cruise on September 8th and couldn't have been happier. The office staff was extremely friendly and helpful with confirmations and directions. And Captain Tim and his crew aboard the Flyer were awesome. They were very pleasant, always smiling, offering to take pictures (without charging you), constantly checking to see if you needed more to drink or eat.I would highly recommend this cruise and Captain Tim and crew!! The crew was special from the moment we stepped on to the boat, The captain and crew made us feel welcomes and appreciated. A witty speech from the Captain and off we went, And let me say it was AMAZING, from the service , to the food and drinks to the way the crew sailed the boat it was nothing less then #1. Thanks Guys.